The first major feud to break out in Texas was born during Texas’ days as a republic. For years, a strip of land in East Texas that bordered Louisiana and Mexico had been ignored by Spanish, Mexican and Texas authorities. By the time Texas became a republic, the swatch of land had developed into a lawless place where land frauds, cattle rustlers, and killings were common. In attempt to control the rampant crime, a group of vigilantes formed who called themselves the “Regulators,” but this group was so extreme in their attempts to stop the crime, that another group of counter-vigilantes soon formed to “moderate” the Regulators. 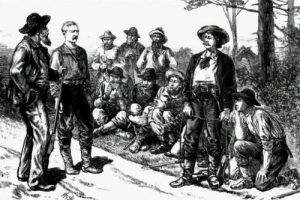 Before long, each faction grew to include sympathizers from miles away, spreading the “war,” which had been primarily located in just Harrison and Shelby counties, to involve Nacogdoches, San Augustine and other East Texas counties. Leading the “Regulators” were two men by the names of Charles W. Jackson and Charles Watt Moorman. The whole affair began with a dispute between a man named Joseph Goodbread and Sheriff Alfred George in 1840. When the sheriff asked for Charles Jackson’s assistance in the matter, Jackson shot and killed Goodbread. Ironically, Jackson, a former Mississippi riverboat captain, was a fugitive himself from Louisiana. Arrested for Goodbread’s killing, Jackson was released pending a trial. Sometime later, he organized the Regulators to rid the area of cattle rustling. Soon afterwards, the Moderators were formed with principal leaders being Edward Merchant, John M. Bradley and Deputy Sheriff James J. Cravens. On July 12, 1841, Charles Jackson’s trial for the killing of Goodbread was scheduled before Judge John M. Hansford in Harrison County, Texas. Hansford had been a friend of Goodbread’s and was a well-known supporter of the Moderator faction. Jackson’s friends, figuring that the man would not get a fair trial before Judge Hansford, arrived at the courthouse armed to the teeth. When Hansford saw the armed men, he fled the courthouse, leaving a note for the local sheriff stating: “I am unwilling to risk my person in the courthouse any longer, when I see myself surrounded by bravos and hired assassins.” The trial ended before it even began. This, of course, enraged the Moderators, who soon took matters into their own hands, ambushing and killing Jackson, as well as an innocent bystander by the name of Lauer. Afterwards, the violence escalated, when the Regulators burned the homes of two families siding with the Moderators. Charles Watt Moorman, allegedly a fugitive from Mississippi, now led the Regulators, spreading the reign of terror north into Panola and Harrison counties, hanging Moderators and driving others out of the area. The group soon numbered so many men that Moorman actually considered overthrowing the Texas government and declaring himself the dictator. In the meantime, residents were beginning to live in constant fear. In October, 1841, Moorman led a party to avenge the Jackson-Lauer killing, surprising the assassins 25 miles north of Crockett. “Arresting” the McFadden brothers, all were hanged with the exception of the youngest brother. In the meantime, articles of impeachment had been filed against Judge John Hansford for his failure at bringing Jackson to trail. On January 19, 1842, Hansford left office to escape the impeachment and retired on his farm near Jonesville. Two years later, a mob of regulators appeared at his house, demanding possession of some slaves that he was holding under a writ of sequestration. When Hansford refused to hand over the slaves, the Regulators killed him. In August, 1844, more than 200 Moderators attacked some 60 Regulators near Shelbyville in what became known as the Church Hill Battle. There was some initial resistance from both sides, but the show of force by the Republic put an end to the conflict. Leaders from both sides were arrested, including Charles Watt Moorman. Some years later after his release, Moorman was shot and killed in Louisiana in 1850.